Alexis Starling was a Photography and Art student at Los Angeles University. One evening she was up near the Hollywood sign taking some pictures for her portfolio when she noticed a shooting star. She snapped away as the star came closer, “…the star fell faster and faster, she gazed up at it frozen, she could not move. Faster and faster the star fell, closer and closer until… silence. For that split second there was nothing. Time stood still. As the star fused with her body they became one. 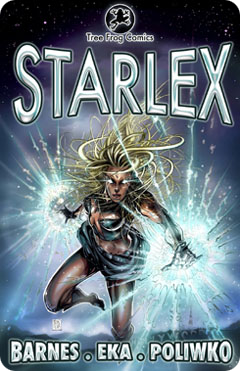 She fell to the ground, her body sparkling like the night sky above…” She absorbed the power of the star and became Starlex! For a Preview, CLICK HERE! and to ORDER, CLICK HERE! Curse of the Vessel #0 – SOLD OUT!!! WINNER of the 2010 SMALL PRESS IDOL CONTEST! Once a brutal mafia enforcer, now his life is not his own. He has been branded with a magical sigil that allows spirits to possess his body at will. On the run from both his deadly former associates and law enforcement, he is wanted for murders and events he has no memory of. 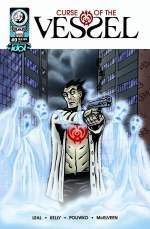 Vincent relentlessly hunts the man who cursed him, continually being hijacked by restless spirits who have their own personalities and agendas, both good and evil. This is the torture he must endure. This is the punishment for his evil past. Vincent Faustino is forever “The Vessel”. For a Preview, CLICK HERE!